Does your Pinterest account need a clean up? I’ve been a Pinterest user since the platform first came out in 2010. As you can imagine, in 6 years I have amassed a very large number of pins and honestly, not many of them were organized very well. Why should you clean up your Pinterest account?? Having an organized Pinterest account will make it easier for you to find what you’re looking for. You saved all these things, you should be able to find and read them later! Your Followers want to be able easily find things as well! Having an organized Pinterest page will ensure that more people follow you and KEEP following you. There are three quick things that you can do RIGHT NOW to clean up your Pinterest account! Delete boards. Delete any boards that are empty or nearly empty. Delete boards that no longer serve you or your audience. Delete boards that don’t fit your brand’s image. For example, if you are a hair stylist, why do you have more boards about food than you do about beauty? Think about what your ideal follower would like to see on your Pinterest account. Get rid of the rest of it. Combine Boards. Small boards don’t get followed as often as larger, full ones. If you have two similar boards, move the pins from one into the other and combine them! For example, maybe you have 1 board for inspirational quotes and another for uplifting quotes. Well, that’s pretty much the same thing, so make them one board! Or maybe you have 30 pins each on boards for “parenting ideas” and “Ideas to do with the kids”. Combine those into one large board called “Family Ideas”. Change your cover images. Not only can you dramatically change the feel of your Pinteerst page by doing this, you will also see an increase in re-pins as people see the new covers. If you’re really ambitious, you can pick cover photos for each board that are similar color or feel. That’s it! 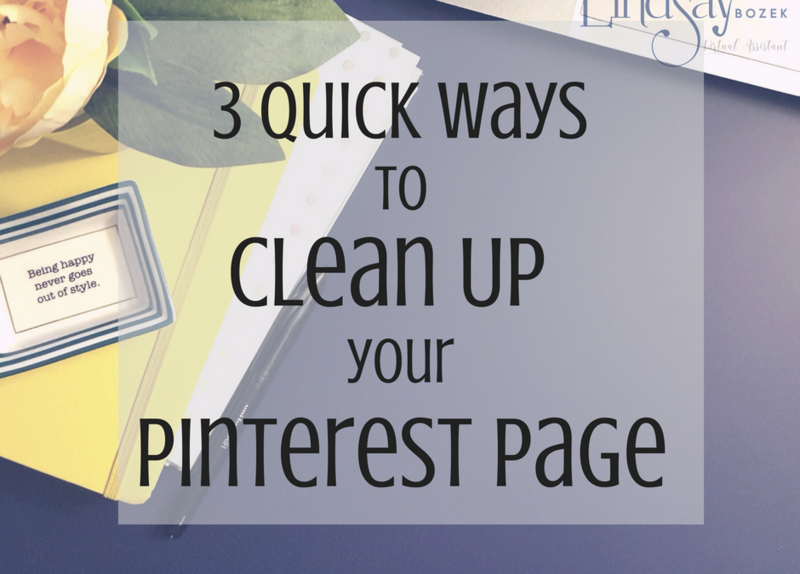 Just three steps to clean up your Pinterest Account! Remember that Pinterest is a fluid platform, and your boards should be ever changing to keep up with trends as well as your own interests and those of your followers. Don’t be afraid to delete or change things in order to make your Pinterest page a better reflection of you.